questions on Stock G.K.(General Knowledge) and Current Affairs.Current Affairs updates till 29 August are updated.Updates on 28 August and 29 August are covered. 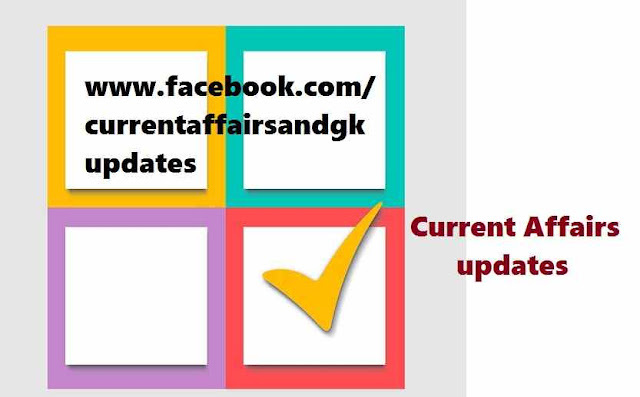 These Updates are useful for upcoming Recruitment Examinations like SSC(Staff Selection Commission), RRB(Railway Recruitment Board),IBPS,SBI Recruitment tests, RBI Recruitment Tests,Insurance,Postal and other State Level Recruitment Tests(TSPSC,APPSC,Haryana Board etc). 2.Ankush,Indian Women Wrestler won Silver Medal in free style category of the Cadet Wrestling World Championships.(Sarajevo,Bosnia). 3.Dafne Schippers (Netherlands) won Gold Medal in Women 200m Championships at Beijing, China. 4.Nickel Ashmeade,Asafa Powell,Usain Bolt and Nesta Carter of Jamaica won Gold Medal in the 4*100m relay during the 15th IAAF World Championships at the National Stadium in Beijing, China. 5.Usain Bolt won Gold Medals in the 100m,200m and 4*100m relay Championships during 15th IAAF World Championships,China. 6.Mo Farah won 5,000 metre Gold Medal in a blistering last lap of 52.6 seconds and became the first man in History to pull off a distance "Triple-Double". 7.Mo Farah won three successive world record 5,000m titles and has now won Golds in both track distance events at the Olympics and two World Championships. 8.President Pranab Mukerjee paid his tribute to the soldiers at India Gate's Amar Jawan Jyoti as the Country marked the 50 years completion of the 1965 India-Pakistan War. 9.Indian Women Hockey Team selected for 2016 Rio Olympics.India's previous qualification for the Games was in 1980. 10.Facebook crosses 100 crores users in a single day. This is the first time that Facebook has clocked 100 crores users in a single day.Facebook was founded by Mark Zuckerberg in the year 2004.